Walla Walla has an historical old Fairgrounds that's been standing proudly since 1866. I've used their arenas a number of times to ride Arizona and Roy but today, as I pulled in, there was a long line of enormous trailers all checking in and setting up for a big AQHA show. Time to switch to plan B. I turned the trailer around and drove out to Bennington Lake, east of town. 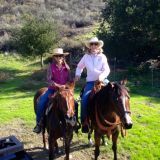 I figured that at least both horses would get some exercise. David and I had gone there last week, and Arizona handled everything, even the one wide water crossing, very well, so I expected it to be a no brainer. They hadn't been out for almost a week and Arizona was pretty full of enthusiasm. As we started down the trail, he was being an unruly kid, pushing at Roy and trying to nip at his neck. Each time he eyed Roy's neck, I would tug on his lead just a little bit or swing the end of the lead rope over, tapping him on the neck. The moment he was where I wanted him beside me and not being silly, I let him out on a very loose lead. Soon he got right in step and stopped being silly. There is a wide inlet that brings the water supply to Bennington Lake that's made of concrete with what look like big square blocks. The water's only about four inches deep, but since horses can't see how deep the water is, this is sometimes an issue. Arizona stopped, and since I didn't want to drop his lead line, so did I. He dropped his head and stepped right in, without any encouragement from me. What a good boy. 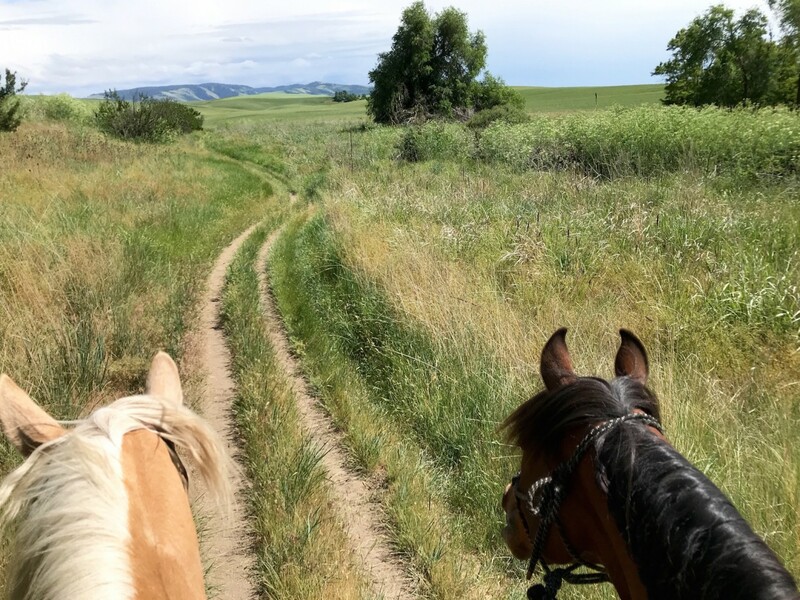 We wound our way up and around the perimeter of the park, a soft cool breeze in our faces, birds singing to us from our left and right, both horses in a relaxed matching cadence, the lead rope swinging between them. The aroma of the green grasses and the sun on my face completed the picture of pure bliss. To our left was a wheat farm. Miles and miles of wheat blanketed the rolling hills all the way up to the base of the Blue Mountains. Suddenly out of the tall waving wheat, two white tailed deer bounded up and right across our trail about 30 yards in front of us, heading to the shelter of some trees to our right. I thought for a moment that neither horse saw them, but they both did... they just sort of watched them go by without loosing a step. The trails here at the lake, vary from dirt roads, to two or three tracks, to single track. Just as I was telling myself what a genius Arizona must be, and how absolutely perfect everything was, he decided to act silly again. Well, he is only three, and life is full of challenges. As we climbed a hill on a single track trail, he reached up and bit Roy on the rump. Roy gave him a little warning kick, which sent Arizona backwards a few steps, head in the air, being overly dramatic. Roy didn't make contact, his foot barely left the ground. The rope slid through my hand and then I pulled a little for him to continue on. Arizona stopped. Just stopped, like he was just done with this ponying bit. I rode Roy around him left and right, asking him to move his feet. He would turn around but he would not move ahead. Instead of fighting him, I figured that he was just having some sort of busy bee action going on in his head and we just stood there, "reassessing the situation" is how I look at it. I wouldn't let him eat. We stood there for about 60 seconds and then his mind came back to him. I petted his neck. "You okay now?" and we went on the rest of the day in a pleasant mood. So, it wasn't a total no brainer. Arizona learned about boundaries, that he's expected to behave like a gentleman, he got some fresh air and some wide open spaces. I patted Roy on the neck after taking my saddle off. "Thank you Roy" He dropped his big head down to accept my rub on his forehead, closing his eyes. With the curry comb I began to brush the sweat from his back. Arizona stood quietly beside him at the trailer, head down, one foot cocked.